Three of every four people haven't heard of Bitcoin, according to a new nationwide survey conducted for TheStreet by GfK. NEW YORK (TheStreet) -- Three of every four people admit they haven't heard of Bitcoin. Just 24% of respondents to a new nationwide survey conducted for TheStreet by GfK said they were familiar with the five-year-old crypto-currency. Click Here for the Survey! Bitcoin gained attention in 2013 as hedge funds considered its viability as a tradable asset and as Wall Street banks released research notes about the virtual currency. Additionally, brothers Cameron and Tyler Winklevoss -- more commonly known as the Winklevoss twins, who gained attention for suing Facebook (FB founder Mark Zuckerberg for allegedly stealing their idea for the social networking site -- drew popular attention to Bitcoin after they revealed a sizeable position in the currency. Despite its growing popularity, the survey shows many people are unaware of Bitcoin, and even fewer, 2%, own any. Diving deeper into the numbers, the 50- to 64-year-old age demographic showed the greatest familiarity with Bitcoin, at 30% of respondents. By comparison, 20% of 18- to 34-year-olds said they'd heard of it. Only 18% of respondents when asked if they would consider using an alternative form of currency like Bitcoin said yes. Some 25% of respondents said they believed Bitcoin hurts the global economy, and 38% said it hurts the U.S. dollar. 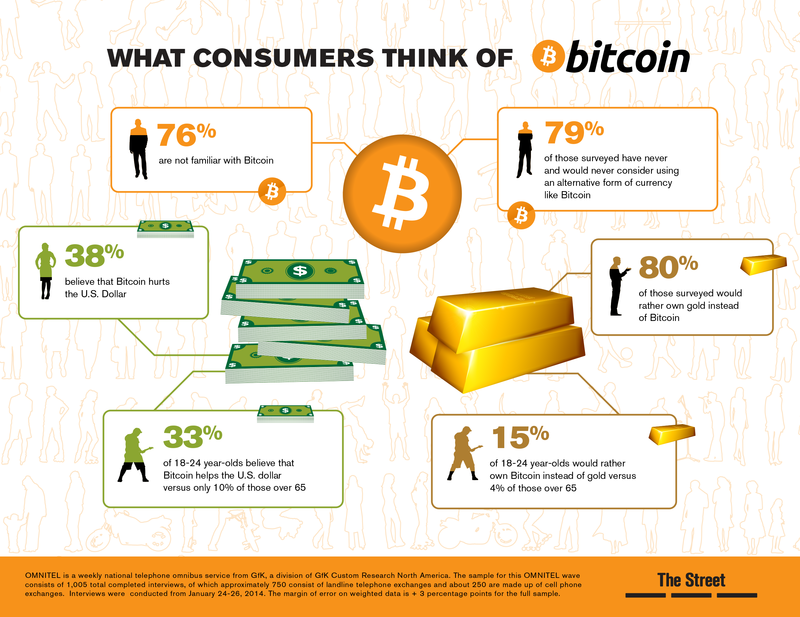 Overwhelmingly, 80% of individuals said they would rather own gold than Bitcoin. Only 5% preferred the crypto-currency.